I’m hoping to do a lot more blog posts in June! I feel bad that I haven’t been highlighting some of my awesome couples…like Stephanie and Brian below. Thank you to Blue Glass Photography for this image! I took some photos of my own of her reception at Villa Botanica that I promise to post soon. Congrats to Emily & Michael! These beautiful images were captured by Blue Glass Photography. Emily & Michael hired them for two hours to capture their ceremony on Hawksnest Beach and then a few other locations, including the Trunk Bay overlook and Maho Bay Beach. I just love the palm trees at Maho Bay! Thank you Blue Glass Photography or sending me these beautiful images! 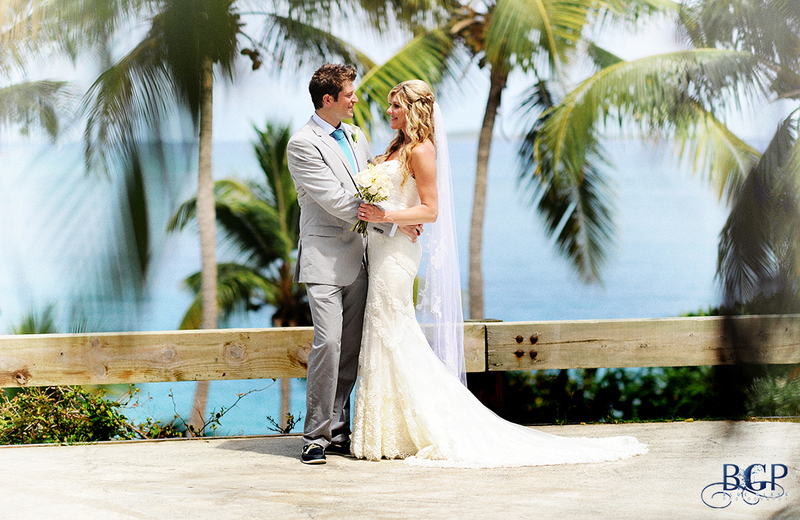 Leah & Richard were married on Lindquist Beach, St. Thomas, US Virgin Islands! So glad Blue Glass sent me a photo of their sea turtle cake topper! I loved this! Look at the cute little pink octopus! Congrats to Krystal & Jamie – what a wedding! Congrats to Yuliya & Ander who were married on 5/3/12 on Lindquist Beach! Alain Brin of Blue Glass Photography sent me these photos – I love the last one, she looks like she’s floating!